A year ago, President Donald Trump signed an executive order reducing the size of Bears Ears National Monument by 85 percent. FARMINGTON — A year ago President Donald Trump signed an executive order that essentially reduced the size of Bears Ears National Monument and created two units within the area of southeast Utah — the Shash Jáa unit and the Indian Creek unit. The very establishment of the controversial Bears Ears National Monument had divided San Juan County in southeast Utah and drew international attention. When Bears Ears National Monument was initially created by President Barack Obama in December 2016 it encompassed nearly two million acres of public land. President Trump's executive order reduced the size to less than 300,000 acres and sparked litigation questioning a president’s authority to reduce the size of a national monument created by another president. Proponents and opponents of the reduction are now fighting it out — both in court and in the court of public opinion. A portion of Arch Canyon is pictured, Monday, May 8, 2017 during an EcoFlight tour west of Blanding Muncipal Airport in Utah. The region is important to indigenous people who claim ancestral ties to the location. Bears Ears takes its name from two buttes that are associated with the five ceremonies in Navajo tradition. The Ute tribes say the buttes were the site of the first Bear Dance. The Hopi Flute Clan traces its lineage to the region and ceremonial songs reference the Bears Ears formation. According to draft management plans, the Hopi shrines near the Bears Ears are regularly visited. This connection led the Hopi, Navajo, Ute Mountain Ute, Southern Ute and Pueblo of Zuni to form a coalition in 2015 pushing for the creation of Bears Ears National Monument to protect cultural resources. The Utah congressional delegation, the San Juan County Commission in Utah, the state legislature and the government as well as the Aneth Chapter of Navajo Nation opposed the creation of the monument, which they said was too large. Opponents said the national monument would have a negative impact on the energy-based economy in southeast Utah, where oil, gas and uranium have been the core economic base. Other opponents worried about the impacts of additional tourism. The five tribes that make up the Bears Ears Inter-tribal Coalition filed a lawsuit immediately after Trump issued his executive order. "We think he did it illegally," said Mark Maryboy, a San Juan County resident who is an active proponent of the original monument and is a member of Navajo Nation. This lawsuit, which was consolidated with other lawsuits from environmental and outdoor recreation groups, is being heard in the federal courts in Washington D.C. The court has also denied requests to move the case to a federal court in Utah. San Juan County, Utah, Commissioner Phil Lyman, left, makes his way to a press conference, Monday,May 8, 2017 at Butler Wash southwest of Blanding, Utah. A group of ranchers and sportsmen intervened in the case in support of the decision to reduce the size of monument. Ranchers Sandy and Gail Johnson argue that the original designation places their ranching operations at risk by placing their entire grazing designation within monument boundaries. In court documents, they state that the reduction in size helped alleviate those fears. Their intervention states eight of 19 presidents since the Antiquities Act was created in 1906 have issued proclamations reducing size of national monuments. Among the proclamations cited was President William Taft reducing Navajo National Monument in Arizona by 90 percent in 1912 after deciding the monument’s size was larger than needed to protect the archaeological sites. When the lawsuit was first filed, the plaintiffs acknowledged that other monuments had been reduced by presidents. They argued that those reductions were not legal and were never challenged in court. The Bears Ears buttes are pictured in May 2017 from Blanding, Utah. U.S. Interior Secretary Ryan Zinke arrives, Monday, May 8, 2017 at the Blanding Muncipal Airport in Utah during a review of the Bears Ears National Monument designation. The Bureau of Land Management and U.S. Forest Service released draft monument management plans in August. A public comment period closed on Nov. 15. The agencies are now reviewing public comments. Utah Diné Bikéyah — proponents of the original monument — and their environmental activist allies submitted more than 200,000 comments, according to spokesman Alastair Lee Bitsói. “We felt it was rush and expedited without enough tribal consultation,” he said. 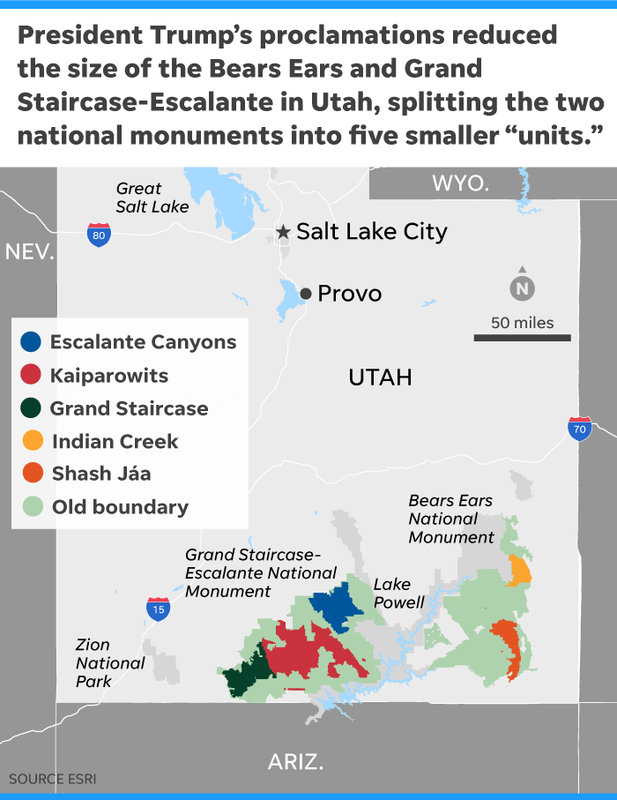 The group's executive director, Gavin Noyes, said the monument management plans should not have been drafted while the decision to reduce the size of the national monument is under litigation. Maryboy said he feels the management plans should prioritize co-management with the tribes, archaeological and cultural sites, paleontology and protection of native species. Maryboy anticipates the U.S. Congress will be asked to pass legislation if the lawsuit fails or if the tribes are not given a co-management role in the national monument. According to the Bureau of Land Management, a notice will be posted on its website and in the Federal Register once the proposed monument management plans and final environmental impact statements are available for both units. Bears Ears supporters wait for U.S. Interior Secretary Ryan Zinke, Monday, May 8, 2017 at Butler Wash southwest of Blanding, Utah. Film maker Angelo Baca said Dec. 4 is an important date in both the Standing Rock protests in the Dakotas against a pipeline and the Bears Ears National Monument debate. It was the day Bears Ears National Monument was reduced in size by 85 percent and it was the deadline set for the protestors at Standing Rock to depart. “We wanted to reclaim the date,” he said. A film festival featuring four films as well as panelists will examine indigenous voices and the Standing Rock and Bears Ears movements. Baca's film, "Shash Jáa: Bears Ears," will be one of the four films shown. The documentary tells about the inter-tribal coalition's efforts to get the region designated as a national monument. The film festival will be from 3 to 8 p.m. Tuesday at the University of Utah Union Theatre in Salt Lake City and panels will be live-streamed on Facebook for people who are unable to attend. Panel discussions include Willie Grayeyes and Kenneth Maryboy, who are both proponents of Bears Ears National Monument and were elected in November to serve on the San Juan County Commission.